The West side of Morro Rock isn't defaced and remains as seen by Juan Rodriguez Cabrillo (1542) and possibly Pedro de Unamuno (1587). This view is from the North. The Chevron tanker is about loaded and ready to go to a refinery. 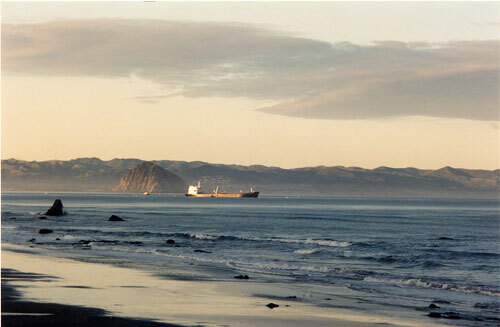 Morro Rock is one of the "nine sisters" a volcano formation that extends directly toward San Luis Obispo. There are a couple more farther out--the last one being Church Rock located at about a two hundred foot depth a few miles out. Local lore says Cabrillo landed near Morro Bay. In addition, some 19th century historians claimed he was buried at San Simeon, not San Miguel Island. A link to a treatise about Pedro de Unamuno can be found in our "Links we Like." On this site we have many old photographs and also some stories about the old-timers of Morro Bay. The time period covered will, for the most part, be the war years, however, we continue to look for earlier events and people. Please note: It is easy to copy photos from this site but it is also illegal. Many of MY photos I will give willingly to anyone who asks. Please honor the donors to this site by not stealing their photographs. Thanks. vlh. Morro Bay Today...Before you delve into the past, you might want to take a slide show tour around the town. Very Early panorama of Morro Bay before there was a park. Photogallery three--Maston's Market, Banning School 1913, et. al. A new trestle picture and the first Morro beach party. Morro Bay Business people of the late 40's _____remember any of these people? Travel Brochure 1947_____"Morrobathing" beauties anyone? They are here! Morro Bay Fishermen about 1950____A great looking bunch of guys. Do you know any of them? John Ennis..a fishing family 1950's____help with some names anyone? The Historical Society Wants You! Where can you find some of the greatest wine in Califorrnia?